Our past studies have shown that cigarette smoke inhibits oviductal functioning in vivo and in vitro. 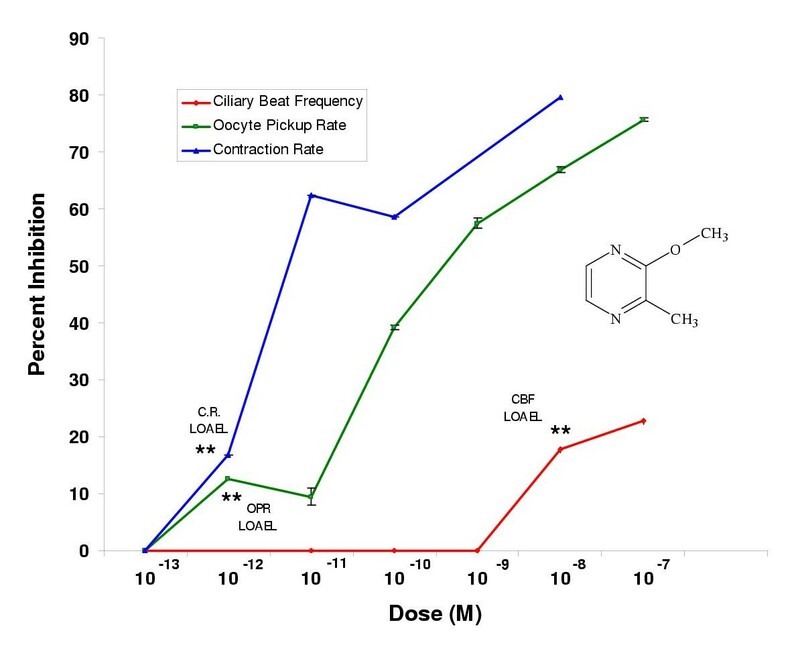 The goals in this study were to identify pyrazine derivatives in cigarette smoke solutions that inhibit ciliary beat frequency, oocyte pickup rate, and infundibular smooth muscle contraction in the hamster oviduct and to determine their lowest observable adverse effect levels (LOAELs) using in vitro bioassays. MS smoke solutions were fractionated using solid phase extraction cartridges and the fractions were both tested on the hamster oviduct in vitro and analyzed by gas chromatography-mass spectrometry to identify individual pyrazine derivatives. Commercial pyrazine standards were purchased, assayed for purity, and tested in dose-response studies on hamster oviducts. The LOAEL and efficacy were determined for each compound in the in vitro bioassays. Statistical significance was determined using the Student's t-Test where p < 0.05. The LOAELs for the most inhibitory pyrazine derivatives in the ciliary beat frequency, oocyte pickup rate, and infundibular smooth muscle contraction assays were as follows: for pyrazine (1 picomolar, 10 picomolar, and 1 nanomolar); for 2-methylpyrazine (1 picomolar, 10 picomolar, and 10 picomolar); and for 2-ethylpyrazine (1 picomolar, 10 picomolar, and 1 picomolar). Six of the seven pyrazine derivatives tested (pyrazine, 2-methylpyrazine, 2-ethylpyrazine, 2-methoxy-3-methylpyrazine, 2,5-dimethylpyrazine, and 2,3,5-trimethylpyrazine) were inhibitory in picomolar or nanomolar doses in all three bioassays, while the seventh derivative, 2,6-dimethylpyrazine, had LOAELs in the nanomolar to micromolar range. This work shows that very low doses of pyrazines significantly inhibit proper oviductal functioning, raising questions regarding the safety of these compounds in cigarettes and other consumer products. The mammalian oviduct plays important roles in reproduction. After an oocyte cumulus complex (OCC) is ovulated from the ovary into the peritoneal or bursal cavity, it is "picked-up" by the infundibular portion of the oviduct [1, 2]. As the OCC adheres to the ciliated outer surface of the infundibulum , cilia beat in the direction of the ostium. Both adhesion and ciliary beating are needed to move the OCC into the ampulla, where fertilization occurs [4–6]. Failure of the OCC to be properly picked-up by the oviduct can result in ectopic pregnancy . Ciliated epithelial cells also line the lumen of the oviduct, where they function in transport of preimplantation embryos through the oviduct [2, 8]. Oviductal smooth muscle contraction also plays a role in transporting the embryo towards the uterus [2, 9–16]. There is both in vivo and in vitro evidence that the mammalian oviduct is a target of cigarette smoke. Oviducts can be exposed either directly to mainstream (MS) smoke, which is the smoke inhaled by active smokers, or indirectly to sidestream (SS) smoke, which burns off the end of cigarettes. Inhalation of MS and SS cigarette smoke by hamsters was correlated with blebbing of ciliated epithelial cells and a decreased ratio of ciliated to secretory cells in the ampulla of the oviduct . MS and SS smoke inhalation by hamsters also slowed oviductal smooth muscle contraction and embryo transport . These effects were seen when the inhaled doses of MS and SS smoke were similar to those received by active and passive smokers as measured by serum cotinine levels [17, 18]. In humans, inhalation of cigarette smoke also inhibited oviductal muscle contraction . Intravenous administration of nicotine, a major component of cigarette smoke, retarded rat embryo cleavage, reduced embryo cell number, and reduced oviductal blood flow , which may be related to reduced smooth muscle contraction . Intravenous nicotine also inhibited oviductal motility in Rhesus monkeys . A newly developed in vitro assay has been useful in studying the effects of smoke exposure on hamster oviductal functioning [4, 5, 8, 16, 23–25]. MS and SS cigarette smoke solutions significantly decreased ciliary beat frequency, oocyte pickup rate, and oviductal smooth muscle contraction in hamster oviducts in vitro; however, in the presence of albumin, SS smoke solutions stimulated ciliary beat frequency [5, 8, 16, 23, 25]. Individual MS and SS smoke constituents (potassium cyanide, acrolein, phenol, acetaldehyde, and formaldehyde), which are ciliotoxic in other models, inhibited oocyte pickup rate and ciliary beat frequency . However, only cyanide was present in cigarette smoke solutions in a high enough concentration to account for the effect seen in vitro . To test the hypothesis that additional ciliotoxic chemicals are present in smoke, we fractionated MS smoke solutions using solid phase extraction cartridges. Twelve pyridine and seven pyrazine compounds were then identified in the active fractions using gas chromatography-mass spectrometry (GC-MS) . We previously showed that several of the pyridines inhibited the ciliary beat frequency, oocyte pickup rate, and infundibular smooth muscle contraction rate at picomolar doses . The purpose of the present study was to test the hypothesis that the pyrazine derivatives identified in active smoke fractions also inhibited oviductal functioning. 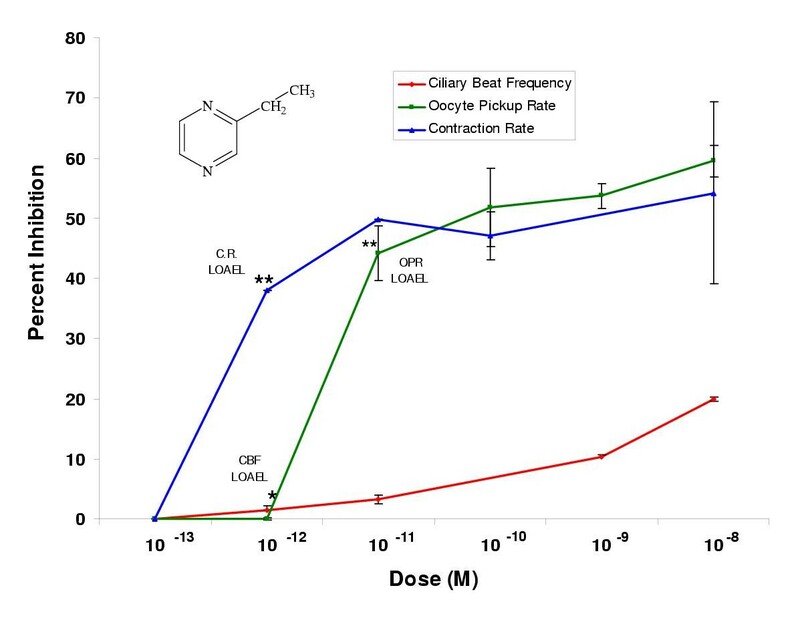 Dose-response experiments were used to determine the lowest observable adverse effect level (LOAEL) and efficacy of each pyrazine derivative on ciliary beat frequency, oocyte pickup rate, and infundibular smooth muscle contraction. Our data show that the pyrazine derivatives, some of which are widely used in consumer products, inhibit oviductal functioning in the picomolar to nanomolar range. Female golden hamsters (Mesocricetus auratus) purchased from Harlan Sprague Dawley (San Diego, CA) were maintained on a 14L:10D cycle in a room at 26°C. Food was administered ad libitum. Hamsters were cycled daily by checking for a vaginal discharge, which occurs on day 1 of their estrous cycle . Female golden hamsters were induced to ovulate by intraperitoneal injection with 25 IU of pregnant mare's serum gonadotropin (PMSG) (CalBiochem, La Jolla, CA.) at 10 AM on day 1 of their estrous cycle, followed by 25 IU of human chorionic gonadotropin (hCG) (Sigma Chemical Co., St. Louis, MO) on day 3 of their estrous cycle, and used twelve hours later on day 4 for all experiments. One animal was injected and used on any given day for an experiment. Unfertilized follicular oocytes were collected by a method previously described . The protocol for the use of hamsters in this study was approved by the campus animal use committee. Oocyte pickup rate, ciliary beat frequency, and infundibular smooth muscle contraction assays were done in 1x Earle's Balanced Salt Solution (EBSS-H) supplemented with sodium bicarbonate, HEPES, and 0.1% BSA . The pH was adjusted to 7.4 with NaOH. This solution was used for dissection, incubation, and as the control solution for all experiments. Pyrazine (99+ %), 2-methylpyrazine (99+ %), 2,5-dimethylpyrazine (98%), 2,6-dimethylpyrazine (98%), 2,3,5-trimethylpyrazine (99%), 2-ethylpyrazine (98%), and 2-methoxy-3-methylpyrazine (99%) were purchased from Aldrich Chemical Company (Milwaukee, WI). MS smoke solutions were made in EBSS-H using 2R1 research-grade cigarettes (University of Kentucky, Louisville, KY) that were smoked on a puffer box built at the University of Kentucky [23, 25]. Diagrams showing the arrangement of the puffer box and vacuum pumps have been published previously . The MS was adjusted to a pH of 7.4 and 0.1% BSA was added. MS smoke solutions were made from 60 puffs of MS smoke pushed through 10 ml of EBSS-H, which is equal to 6 puffs/ml and is defined as 6 puff equivalents per millilitre [16, 23, 25]. Bond Elut solid phase extraction (SPE) cartridges, 3 cc, 500 g capacity (Phenomenex, Torrance, CA) were used to fractionate smoke solutions and concentrate chemicals that inhibit oviductal functioning. Cartridges which were screened for their ability to bind inhibitory chemicals included a variety of non-polar, polar, and anion and cation exchange cartridges: NH2, 2OH, CN, CBA, SCX, SAX, C18, C8, C2, CH, SI, and PH. The protocol used to screen the cartridges for their ability to bind oviductal toxicants in smoke solutions has been described previously . The C8, PH, and CN cartridges retained most of the inhibitory activity in MS smoke solutions as determined in the oviductal assays. To identify the components in aqueous smoke solutions that inhibit oviductal functioning, MS smoke solutions were analyzed with GC-MS after solid phase extraction on a C8, PH, or CN cartridge and elution with methanol. Two microliters of each sample was injected into a Hewlett Packard 5890 GC interfaced to an HP-5971A MSD quadrupole mass selective detector with a Zebron ZB1701 cyanopropyl phenyl column 30 m × 0.32 mm with 1 micron phase thickness from Phenomenex (Torrance, CA.) as described previously . Identifications of compounds were made using the mass spectrometry data matched to mass spectral library entries. Compound identities were confirmed using purified standards and matching both mass spectra and retention times. For this assay, one hamster was injected with 25 IU of PMSG on day 1 of the estrous cycle, followed by 25 IU of hCG on day 3. On the day of the experiment, approximately 12 hours after the injection of hCG, the hamster was sacrificed using CO2, and two oviducts and ovaries were removed and separated. The two ovaries were isolated in EBSS-H with 0.1% BSA, and expanded follicles were poked with a dissecting needle to release the oocyte cumulus complexes (OCCs). Approximately 7–15 mature expanded OCCs were recovered from each ovary. OCCs were transferred to a fresh Petri dish and placed in EBSS-H with 0.1% BSA. Two infundibula were dissected from the oviducts leaving the ampullas attached to function as handles. The infundibula were placed in perfusion chambers containing EBSS-H with 0.1% BSA, and the ampullas were placed into the holding pipettes so the infundibula remained stationary throughout the experiment. Oocyte pick-up rate was measured using hamster oviduct explants in an in vitro assay developed in our lab [4, 16, 25, 26]. Using a Wild 5A stereoscopic microscope, an OCC was placed onto the infundibulum, and the length of time for the OCC to traverse a defined path was recorded. This defined path was used for both the control and treatment groups. A total of six to ten measurements were made and the means ± standard deviations were calculated for each treatment group. A single experiment was defined as the treatment of a single infundibulum with the control medium (EBSS-H with 0.1% BSA), and a single dose of the test chemical diluted in EBSS-H with 0.1% BSA. Ciliary beat frequency was measured using hamster oviductal explants in an in vitro assay developed in our lab [23, 25, 26]. A video image capture system was used to measure ciliary beat frequency as described previously . Infundibula were placed on a Wild M5A stereoscopic microscope, and a video image was captured using an Hitachi KP-D50 color digital camera and viewed on a Dell Optiplex GXA computer. Images of the beating cilia were recorded onto a Super VHS videotape using a Sony Hi-Fi SVHS recorder. To measure ciliary beat frequency, the videotape was played back frame-by-frame. Video images were recorded at 30 frames per second. Each frame represented a fraction of a cycle; the completion of a cycle was equivalent to one beat. The number of frames per cycle (or frames per beat) were measured and then converted into beats per second. A single experiment was defined as the treatment of a single infundibulum with the control medium (EBSS-H with 0.1% BSA) and a single dose of the test chemical diluted in EBSS-H with 0.1% BSA. Ten measurements were made for each infundibulum for each treatment group. Recordings were made for 60 to 150 seconds per region, which ensured an adequate amount of data for analysis. The same region was recorded for both the control and treated groups. A new assay for measuring infundibular muscle contraction was developed in our lab after observing consistent infundibular contractions that slowed or ceased after treatment with MS smoke solutions . A single experiment was defined as the treatment of a single infundibulum with the control medium (EBSS-H with 0.1% BSA) and a single dose of the test chemical diluted in EBSS-H with 0.1% BSA. A perfusion chamber containing the infundibulum was placed on a Wild M5A stereoscopic microscope, and a video image was captured using an Hitachi KP-D50 color digital camera and viewed with a Dell Optiplex GXA computer and an NEC Multisync 5FG monitor. Infundibular contractions were observed and measured directly on the computer monitor. As the infundibulum contracted, the distance of the contraction was measured in centimeters and then converted to micrometers as described previously . For each experiment, distance and frequency were measured six times for a single infundibulum per treatment group (the control medium EBSS-H with 0.1% BSA and a single dose of the test chemical diluted in EBSS-H with 0.1% BSA). The perfusion chamber was equipped with a pipette that held the ampulla of the oviduct in place facilitating the ability to return to the same region for both the control and treatment measurements. For the infundibular smooth muscle contraction assay, the same region was observed and the same direction of contraction was used for both the control and treatment groups. To determine LOAELs for each pyrazine derivative in each bioassay, two levels of analysis were performed. First, a preliminary screen of the pyrazine compounds was done using a single infundibulum per dose group (10-13–10-5 M). For each infundibulum, 6–10 control, treatment, and recovery measurements were taken, and the means were compared using a one-way ANOVA. The lowest significant inhibitory dose provided an estimate of the LOAELs for each pyrazine derivative in each assay. Since the estimated LOAELs were based on only one infundibulum per dose, additional experiments were performed at the estimated LOAEL doses to increase the sample size to n = 4 infundibula for each pyrazine derivative in each bioassay. The statistical significance of these results was evaluated using Student's t-Test to compare the mean of the control (n = 4 infundibula) to the mean at the estimated LOAEL dose (n = 4 infundibula) for each pyrazine derivative in each bioassay (Figs. 1,2,3,4,5,6,7). MS Excel 2002 (Microsoft Corp, Redmond, WA.) was used for all statistical analysis. Means were considered to be significantly different for p < 0.05. Pyrazine inhibited oviductal functioning at picomolar and nanomolar doses. Percent inhibition was derived by comparing each dose (n ≥ 2 infundibula) to an untreated control incubated in the vehicle alone (EBSS-H with 0.1% BSA). Each LOAEL (n = 4 infundibula) was compared to the untreated control (n = 4) using the Student's t-Test where *p < 0.5; **p < 0.01; ***p < 0.001. 2-Methylpyrazine inhibited oviductal functioning in picomolar doses. Percent inhibition was derived by comparing each dose (n ≥ 2 infundibula) to an untreated control incubated in the vehicle alone (EBSS-H with 0.1% BSA). Each LOAEL (n = 4 infundibula) was compared to the untreated control (n = 4) using the Student's t-Test where *p < 0.5; **p < 0.01; ***p < 0.001. 2-Ethylpyrazine inhibited oviductal functioning in picomolar doses. Percent inhibition was derived by comparing each dose (n ≥ 2 infundibula) to an untreated control incubated in the vehicle alone (EBSS-H with 0.1% BSA). Each LOAEL (n = 4 infundibula) was compared to the untreated control (n = 4) using the Student's t-Test where *p < 0.5; **p < 0.01; ***p < 0.001. 2,5-Dimethylpyrazine inhibited oviductal functioning in nanomolar doses. Percent inhibition was derived by comparing each dose (n ≥ 2 infundibula) to an untreated control incubated in the vehicle alone (EBSS-H with 0.1% BSA). Each LOAEL (n = 4 infundibula) was compared to the untreated control (n = 4) using the Student's t-Test where *p < 0.5; **p < 0.01; ***p < 0.001. 2,6-Dimethylpyrazine inhibited oviductal functioning in nanomolar or higher doses. Percent inhibition was derived by comparing each dose (n ≥ 2 infundibula) to an untreated control incubated in the vehicle alone (EBSS-H with 0.1% BSA). Each LOAEL (n = 4 infundibula) was compared to the untreated control (n = 4) using the Student's t-Test where *p < 0.5; **p <0.01; ***p < 0.001. 2,3,5-Trimethylpyrazine inhibited oviductal functioning in nanomolar doses. Percent inhibition was derived by comparing each dose (n ≥ 2 infundibula) to an untreated control incubated in the vehicle alone (EBSS-H with 0.1% BSA). Each LOAEL (n = 4 infundibula) was compared to the untreated control (n = 4) using the Student's t-Test where *p < 0.5; **p < 0.01; ***p < 0.001. 2-Methoxy-3-methylpyrazine inhibited oviductal functioning innanomolar and picomolar doses. Percent inhibition was derived by comparing each dose (n ≥ 2 infundibula) to an untreated control incubated in the vehicle alone (EBSS-H with 0.1% BSA). Each LOAEL (n = 4 infundibula) was compared to the untreated control (n = 4) using the Student's t-Test where *p < 0.5; **p < 0.01; ***p < 0.001. To analyze the efficacies of each pyrazine derivative relative to the parent compound pyrazine, each derivative was treated as a separate experiment, and statistical analyses were performed by comparing the percent inhibition of the derivative (n = 4 infundibula) to the percent inhibition of pyrazine (n = 4 infundibula) at the LOAEL doses using Student's t-Test. These statistics are reported in Table 2. When MS cigarette smoke solution was passed through twelve solid phase extraction cartridges, the CN, PH, and C8 cartridges were the most effective at retaining the compounds responsible for the inhibition of ciliary beat frequency, oocyte pickup rate, and infundibular smooth muscle contraction . Pyrazine derivatives were identified by gas chromatography-mass spectrometry (GC-MS) as a predominant class of compounds that were retained by these cartridges, and the specific pyrazines in the active fractions of MS smoke solutions are shown for each cartridge in Table 1. 2-Methylpyrazine was the most abundant in the cartridge eluates. Commercially available standards of the identified pyrazines (2-methylpyrazine, 2,5-dimethylpyrazine, 2,6-dimethylpyrazine, 2,3,5-trimethylpyrazine, 2-ethylpyrazine, and 2-methoxy-3-methylpyrazine) were purchased and tested in dose-response studies on the oviduct to determine their effect on ciliary beat frequency, oocyte pickup rate, and infundibular muscle contraction. In addition, pyrazine, which was not found in the cartridge eluates, was also purchased and tested to compare the parent compound to derivatives with methyl, ethyl, or methoxy substitutions on the pyrazine ring. The results from the dose-response experiments are reported for each compound in Figures 1,2,3,4,5,6,7 and are summarized in Table 2.
a LOAEL is lowest observable adverse effect level b Efficacy is the mean percentage of inhibition at the LOAEL c Student's t-Test was performed on efficacies comparing each chemical back to pyrazine for each bioassay. * p < 0.05; ** p < 0.01; *** p < 0.001. Pyrazine inhibited ciliary beat frequency and oocyte pickup rate at picomolar doses and infundibular smooth muscle contraction at nanomolar doses when compared to the control, which was treated with the vehicle (EBSS-H with 0.1% BSA) alone (Fig. 1). 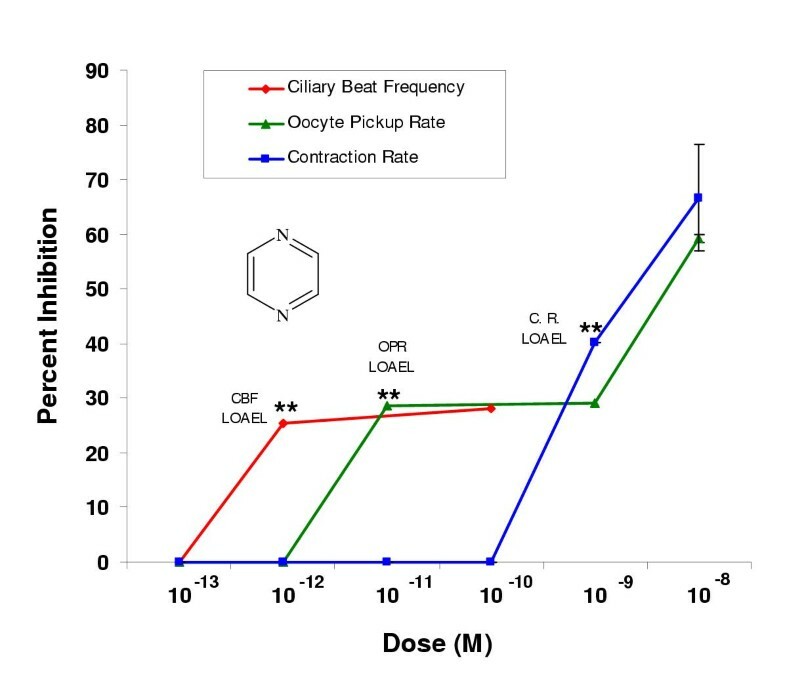 Significant inhibition of ciliary beat frequency, oocyte pickup rate, and infundibular smooth muscle contraction occurred at 10-12 M, 10-11 M, and 10-9 M, respectively, which were the lowest observable adverse effect levels (LOAELs) (Fig. 1, Table 2). The efficacy for all three oviductal assays was determined using the percent inhibition at the LOAEL. The efficacies in the ciliary beat frequency, oocyte pickup rate, and infundibular smooth muscle contraction assays were 25%, 29%, and 40%, respectively (Table 2). Pyrazine compounds with single methyl (2-methylpyrazine) or single ethyl (2-ethylpyrazine) substitutions had LOAELs in the picomolar range for all three bioassays (Figs. 2, 3). 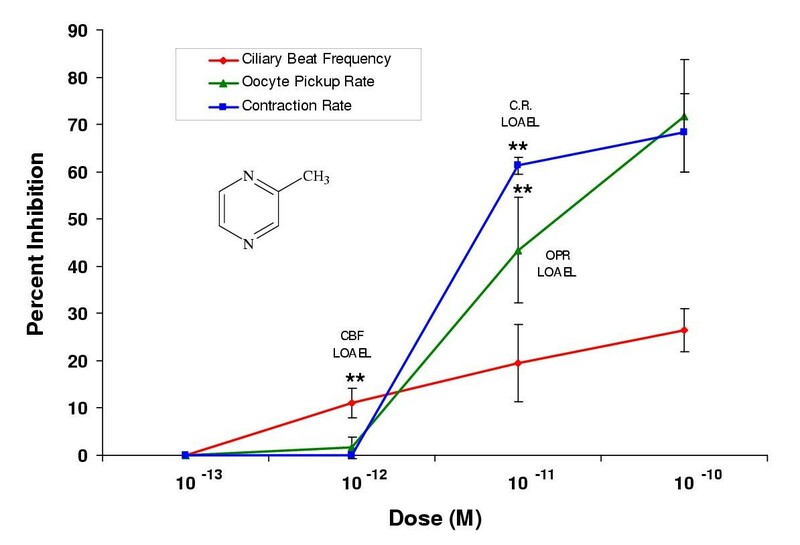 For 2-methylpyrazine, the LOAELs were 10-12 M, 10-11 M, and 10-9 M in the ciliary beat frequency, oocyte pickup rate, and infundibular smooth muscle contraction assays, respectively (Fig. 2, Table 2). 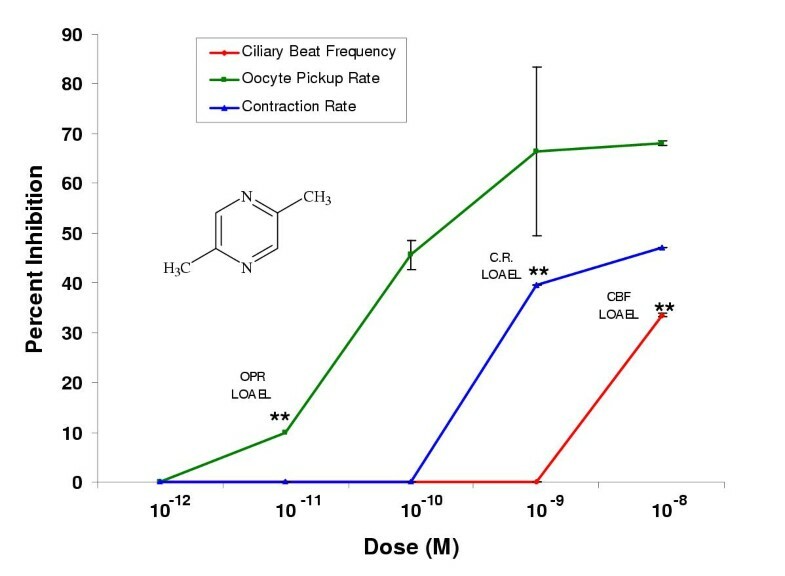 For 2-ethylpyrazine, the LOAELs were 10-12 M, 10-11 M, and 10-12 M in the ciliary beat frequency, oocyte pickup rate, and infundibular smooth muscle contraction rate assays, respectively (Fig. 3, Table 2). While the LOAELs for ciliary beat frequency and oocyte pickup rate did not change relative to pyrazine for these two derivatives, the LOAELs in the smooth muscle contraction assay decreased 100 and 1000-fold, respectively for 2-methylpyrazine and 2-ethylpyrazine (Figs. 2, 3, Table 2). In most cases, single methyl and single ethyl substitutions on pyrazine altered the efficacies when compared to pyrazine alone. For both 2-methyl and 2-ethylpyrazine, the efficacies for the ciliary beat frequency assay were significantly lower than for pyrazine alone, while efficacies for these two compounds significantly increased relative to pyrazine in the oocyte pickup rate assay (Table 2). In the infundibular smooth muscle contraction assay, the single ethyl substitution did not have a significant effect on efficacy, while the single methyl substitution significantly increased efficacy compared to pyrazine (Table 2). In general, the dimethylpyrazines were less potent than the single ethyl or methyl substituted pyrazines or pyrazine alone. 2,5-Dimethylpyrazine had LOAELs equivalent to pyrazine in the oocyte pickup rate (10-11 M) and infundibular smooth muscle contraction rate (10-9 M) assays; however, its LOAEL in the ciliary beat frequency assay (10-8 M) was 10,000 times greater than that of pyrazine (10-12 M) (Fig. 4, Table 2). In all cases, 2,5-dimethylpyrazine was more potent than 2,6-dimethylpyrazine, which inhibited ciliary beat frequency, oocyte pickup rate, and infundibular smooth muscle contraction with LOAELs of 10-6 M, 10-9 M, and 10-7 M, respectively (Fig. 5, Table 2). 2,5-Dimethylpyrazine had the highest efficacy of all the pyrazine compounds in the ciliary beat frequency assay (34%), however it was not statistically different from pyrazine. 2,5-Dimethylpyrazine (9.9%) and 2,6-dimethylpyrazine (3.5%) had significantly lower efficacies in the oocyte pickup rate assay compared to pyrazine. 2,6-Dimethylpyrazine was the least potent of all the compounds tested, however, its efficacy in the infundibular smooth muscle contraction assay (85%) was significantly higher than pyrazine (Table 2). For 2,3,5-trimethylpyrazine, the LOAELs were 10-9 M, 10-10 M, and 10-9 M in the ciliary beat frequency, oocyte pickup rate, and infundibular smooth muscle contraction assays, respectively (Fig. 6, Table 2). For the ciliary beat frequency assay, the LOAEL was lower than the dimethyl pyrazines, but not as low as the ethyl or methyl substituted pyrazines or pyrazine alone. 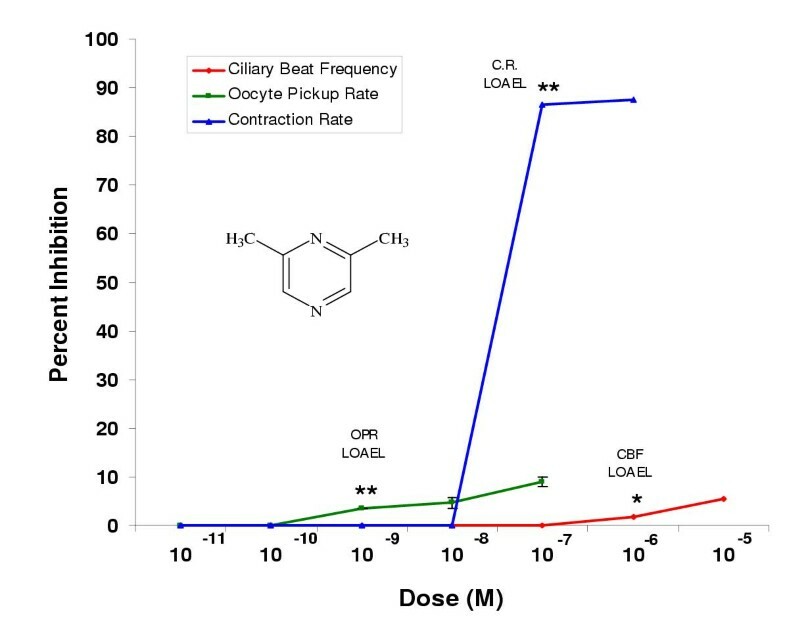 For the oocyte pickup rate assay, the LOAEL was lower than 2,6-dimethylpyrazine, but higher than all the other pyrazines. For the infundibular smooth muscle contraction assay, the LOAEL was the same as that for pyrazine and 2,5-dimethylpyrazine, but higher than the ethyl or methyl substituted pyrazines. For 2-methoxy-3-methylpyrazine the LOAELs were 10-9 M, 10-12 M, and 10-12 M, respectively, for the ciliary beat frequency, oocyte pickup rate, and infundibular muscle contraction assays (Fig. 7, Table 2). In the oocyte pickup rate and infundibular smooth muscle contraction rate assays the LOAELs were the lowest (10-12 M) compared to all the other pyrazines tested. For the ciliary beat frequency assay, the LOAEL was the same as for the trimethyl substituted pyrazine (10-9 M). The efficacies for 2,3,5-trimethylpyrazine (10%) and 2-methoxy-3-methylpyrazine (13%) for oocyte pickup rate were significantly lower than for pyrazine alone (Table 2). The efficacy of 2,3,5-trimethylpyrazine (58%) for the infundibular smooth muscle contraction rate assay was significantly higher than for pyrazine. 2-Methoxy-3-methylpyrazine had the lowest efficacy (17%) in the infundibular smooth muscle contraction assay and was significantly lower than pyrazine, although its LOAEL is among the lowest (Table 2). The efficacies for 2,3,5-trimethylpyrazine and 2-methoxy-3-methylpyrazine for the ciliary beat frequency assay were not significantly different than for pyrazine (Table 2). Six pyrazine derivatives containing hydrocarbon substitutions were identified in the active fractions of MS smoke solutions that were known to inhibit oviductal functioning. In the current study, pyrazine and the identified pyrazine derivatives inhibited ciliary beat frequency, oocyte pickup rate, and smooth muscle contraction in hamster oviductal explants. The LOAELs and efficacies for each compound tested in this study are compared in Table 2 for each of the oviductal assays. The finding that these pyrazine compounds are inhibitory at very low doses is significant because of their widespread use as additives in food and tobacco . The hierarchies of potency of the pyrazine compounds as determined by the LOAELs in this study for the ciliary beat frequency, oocyte pickup rate, and infundibular smooth muscle contraction rate assays are summarized in Table 3. In all the assays, pyrazine derivatives showed an equal or greater potency than pyrazine. A previous study that looked at the effect of pyridine derivatives on ciliary beat frequency, oocyte pickup rate, and infundibular smooth muscle contraction found that pyridine derivatives with a single ethyl substitution and several with a single methyl substitution were also effective in picomolar doses and were ten million times more inhibitory than pyridine alone . The pyrazine ring differs from the pyridine ring only by the presence of a second nitrogen atom in the fourth position of the ring, yet pyrazine was at least 1 million-fold more inhibitory than pyridine in all three bioassays. The efficacy of each pyrazine derivative identified in the cigarette smoke solutions was calculated for ciliary beat frequency, oocyte pickup rate, and infundibular smooth muscle contraction rate (Table 2). In all three assays, the pyrazines with single ethyl or methyl substitutions were among the most inhibitory at the LOAEL dose. Single methyl and ethyl substituted pyrazines were always in the number one or number two position in the hierarchy of potency (Table 3) for each bioassay irrespective of water solubility or lipophilicity. In general, pyrazine and its derivatives were more effective at inhibiting oocyte pickup rate and infundibular smooth muscle contraction rate than ciliary beat frequency. A similar pattern was observed for the pyridine compounds tested previously on oviductal functioning . We have now discovered two classes of smoke constituents, pyridines  and pyrazines, that are ciliotoxic at very low doses in vitro. 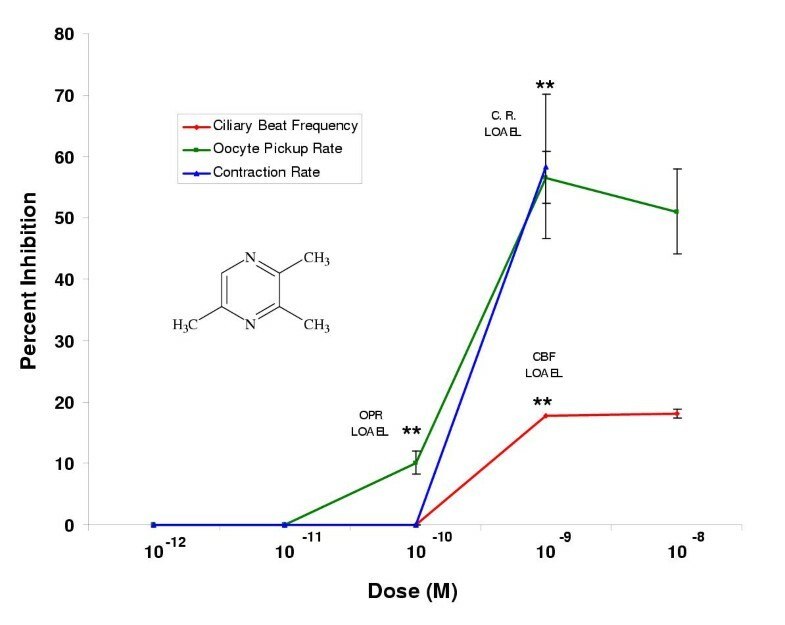 In this study, pyrazine and its derivatives inhibited ciliary beat frequency at doses much lower than previously shown with cyanide. However, ciliary beat frequency was only modestly affected by pyrazine derivatives compared to oocyte pickup rate. Therefore, it is probable that pyrazine derivatives inhibited oocyte pickup rate by affecting another factor(s) in addition to ciliary beat frequency. We have previously shown that adhesion of the OCC matrix to the tips of the cilia is also needed for successful OCC pickup . It is possible that pyrazine and its derivatives had a stronger effect on adhesion than on ciliary beat frequency, which could account for the stronger inhibition of oocyte pickup rate that we observed. Although our results cannot be extrapolated to humans, epidemiological studies show that women who smoke are at increased risk for ectopic pregnancies and spontaneous abortions [7, 12, 15, 29–31] , two conditions that could be caused by inhibition of oocyte pickup. In this study, pyrazine derivatives found in cigarette smoke also adversely affected smooth muscle contraction of the infundibular portion of the hamster oviduct in vitro at nanomolar and picomolar doses. Previously, pyridine compounds were also shown to inhibit infundibular smooth muscle contraction at similarly low doses . The pyridine and pyrazine data suggest that the inhibition of infundibular smooth muscle contraction observed in vitro using MS smoke solutions  is due to the pyridine and pyrazine derivatives found in the smoke solutions. These individual smoke constituents may also be responsible for the inhibition of smooth muscle contraction that was observed in the hamster oviduct after in vivo inhalation of MS cigarette smoke . In addition to effects on oviductal functioning, the pyrazine and pyridine derivatives found in cigarette smoke impair other biological processes. Six pyrazine and twelve pyridine derivatives along with their parent compounds inhibited growth of the chick chorioallantoic membrane (CAM) [32, 33]. Pyrazine was the most potent chemical tested and inhibited both CAM and embryo growth at picomolar doses due to inhibition of DNA synthesis . Several pyrazine  and pyridine (unpublished data) derivatives also perturbed pattern formation of blood vessels, migration of mesodermal blood vessels to the ectoderm, and differentiation of the capillary plexus in CAMs. Several pyrazine and pyridine derivatives with single ethyl or methyl substitutions (3-ethylpyridine, 2-ethylpyridine, 2-methylpyridine, and 2-ethylpyrazine) inhibited CAM and/or embryo growth [32, 33] and oviductal functioning  at picomolar or nanomolar doses. Taken together, these observations suggest that pyridine and pyrazine derivatives impair diverse biological processes either by affecting different mechanisms that control these different processes or by acting through one common mechanism that is fundamental to multiple processes. The concentrations of several pyrazine derivatives in MS and SS cigarette smoke were determined by Brunnemann et al. for a single brand commercial U.S. non-filtered cigarette . For this particular cigarette type, 2-methylpyrazine was present in the gas phase of MS smoke at 2.2 ppm and in gas phase of SS smoke at 55 ppm . The combined concentration of 2,3-dimethylpyrazine, 2,5-dimethylpyrazine, and 2,6-dimethylpyrazine was 3.9 ppm in the gas phase of MS and 61 ppm in gas phase of SS smoke. Quantitative analysis of cigarette smoke has shown that both pyridine and pyrazine compounds are more concentrated in SS than MS smoke . 2-Methylpyrazine was one of the most potent pyrazine derivatives in this study, with a LOAEL in several of the bioassays of 10-12 M. The concentrations of pyrazine derivatives in the serum or tissues of smokers are unknown. However, since the pyrazine compounds are inhibitory at such low doses, it is likely that these pyrazine derivatives are present in vivo at high enough concentrations to adversely affect processes such as ciliary beat frequency, oocyte pickup, and smooth muscle contraction. Pyrazine and the six pyrazine derivatives examined in this study appear on the FEMA GRAS list of chemicals . This is a list of chemicals published by the F lavor and E xtract M anufacturers' A ssociation (FEMA) that are g enerally r egarded a s s afe (GRAS) and are therefore added directly to food, drinks, tobacco, cosmetics, and fragrances. Pyrazines with alkyl and alkoxy substitutions may also be produced from condensation of hexoses and amino acids at elevated temperatures. Their precursors are the amine and carbonyl compounds found in uncooked foods . Pyrazine derivatives are absorbed optimally at intestinal pH . The metabolism of pyrazine derivatives involves oxidation of side-chain alkyl or oxygenated functional groups and hydroxylation of the pyrazine ring . Pyrazines are responsible for roasted or smoky flavors and are widely distributed in food products . The range for the average usual and average maximum concentrations of pyrazine added to various types of food are (0.3–1.0 ppm) and (1.5–5.0 ppm) respectively . The LOAEL doses for pyrazine in our study were (0.4 ppb) for the ciliary beat frequency assay, (4 ppb) for the oocyte pickup rate assay, and (400 ppb) for the infundibular smooth muscle contraction assay, which are all less than the concentrations of pyrazine added to food. However, the dose eaten is probably not equivalent to the dose at the oviduct. Recently, the safety of pyrazine compounds was re-evaluated for FEMA, and it was concluded that pyrazine compounds are safe for use in human consumer products . Although many of the biological processes, for example, acute toxicity, sub-chronic toxicity, histopathology, hematology, organ weights, clinical chemistry, genotoxicity, hepatotoxicity, and carcinogenicity, were reviewed and were not significantly affected by pyrazine compounds, there were reproductive effects shown in several of the papers reviewed by Adams et al., . For example, 2,5-dimethylpyrazine delayed the onset of puberty in female mice due to effects on adrenal function  and caused a decrease in uterine weight in rats in a dose-dependent manner, possibly by inhibition of uterine uptake of estradiol . In male rats, 3,6-dimethylpyrazine-2-thiol caused a decrease in prostate and seminal vesicle weights , and 2,5-dimethylpyrazine decreased levels of plasma testosterone, polyamines, and acid phosphatase in the prostate . Our data show that very low doses of pyrazine and six of its derivatives adversely affect various cell processes important in oviductal functioning. When combined with prior reproductive studies, our results raise questions about the safety of these compounds in consumer products even at very low doses. In conclusion, the results of our study show that individual pyrazine compounds identified in MS and SS smoke solutions inhibit ciliary beat frequency, oocyte pickup rate, and infundibular smooth muscle contraction rate at picomolar and nanomolar doses. Prior studies have shown that pyrazines also impair growth and angiogenesis in CAMs at very low doses. Given the broad spectrum of effects that pyrazines exhibit in these diverse assays and their widespread use in consumer products, they may not be as safe as previously thought and further toxicological testing of pyrazines should be done. The authors would like to thank Jeanne Chung and Maria Park for their suggestions on this manuscript and Tobacco-Related Disease Research Program (TRDRP) for support by grant 10RT-0239. KR carried out the dose-response experiments, data collection and analysis, and the solid phase extraction and GC-MS experiments and analysis. RR carried out the analysis of the raw ciliary beat frequency data. JA provided equipment and technical support for GC-MS. PT provided project supervision and assistance with writing the manuscript.